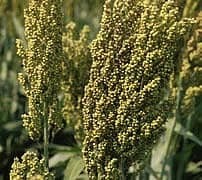 Feed: Grain sorghum is used primarily for feed produced from the grain although grain sorghum can be used for silage if necessary. It is not recommended for grazing. Wildlife: Grain sorghum is a favorite food source for upland game birds, migratory birds and other non game birds. Grain sorghum originated in northeast Africa. It is a coarse stemmed warm season annual grass that can grow 4 feet tall and typically has large seed heads. The leaves are similar to corn but are shorter and sometimes wider. Seed is produced on a panicle which is compact to semi-open and erect. There are approximately 15,000 seeds per pound. Grain sorghum is adapted throughout the United States and southern Canada. Grain sorghum performs best in moderate to well drained soils with a soil pH between 5.5 and 7.5. Drought tolerance is high with the water requirement being approximately 1/3 less than corn. Planting rates vary from 4 to 20 pounds per acre with the lower seeding rates based on average annual rainfall for dryland conditions and the higher seeding rates for irrigated acreage. Planting dates are usually from May to July but can be earlier in the deep South. Soil temperature needs to be a minimum of 60 degrees Fahrenheit for germination. Seeding depth should be 1 inch. good rain; do not cut within 7 days of a killing frost; cut at a higher stubble height if under stress since nitrates accumulate in the lower stalk, and delay feeding silage 6 to 8 weeks after ensiling to allow prussic acid to dissipate. Never feed forage from grain sorghum to horses.